It’s probably not the weird thing you were thinking. 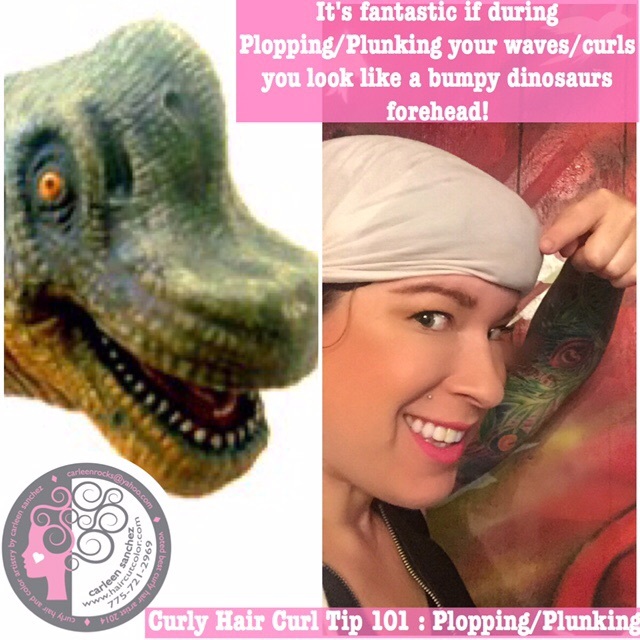 Plopping is a technique for naturally wavy and curly headed people to enhance curls and to get the hair out of your way after you get out of the shower. I think it is a necessary step if your hair is longer than your shoulders and especially needed if you have looser curls or waves. My tip is how to make your own plopping head wrap out of a tshirt zoom in on the picture to read the steps. I’ve found L\XL Men’s T-shirts to work the best for my big head.If you have a smaller head a smaller shirt will work. 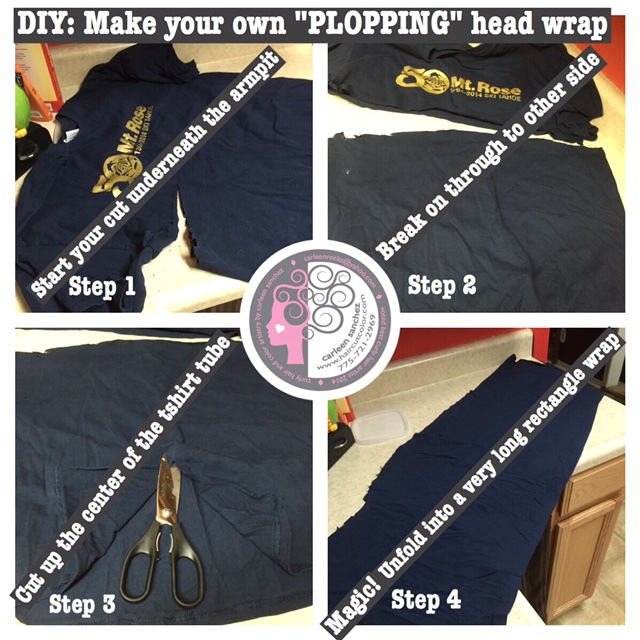 Second tip is how your hair should look when you have put your hair slinky style into the head wrap and secured it to you head.Now you are plopping! You will have a hair horn or bump right above your forehead. Now get pretty for your day! I like to plop my swavy hair for at least 30 minutes. Then I take it down gently and my curls are partially dry. I then clip my roots for volume and choose to air dry or diffuse dry completely before scrunching out the crunch and revealing beautiful waves. 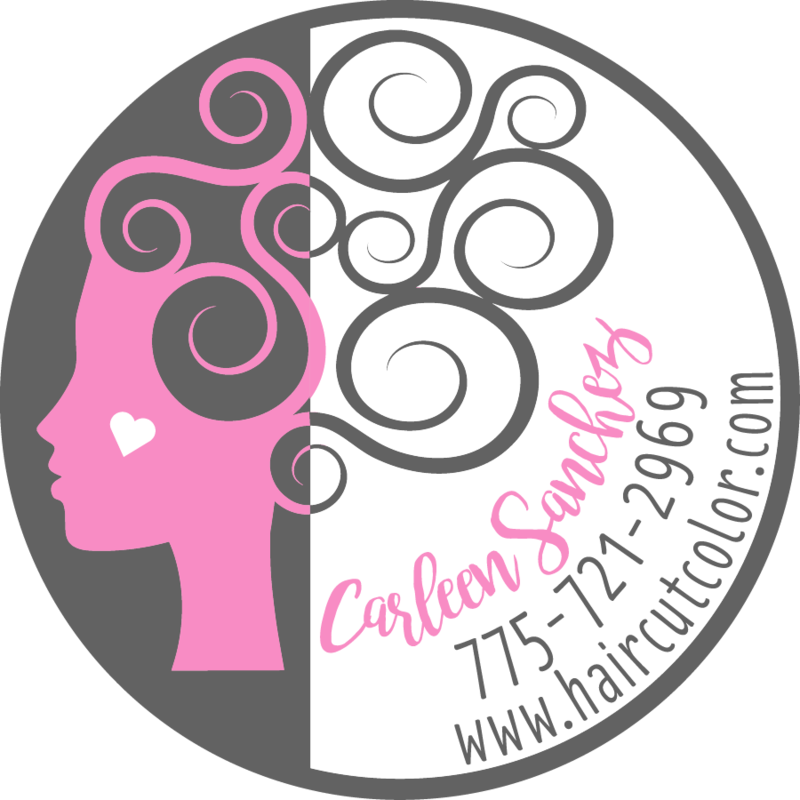 Want more info on plopping, clipping and naturally curly hair solutions??? Want more information on other curly hair techniques? Go to my website www.haircutcolor.com. 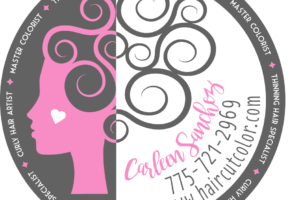 On it you can find free curly hair resources with links to websites and blogs with amazing info from my Curl Colleagues (THE BEST curl artists around the world and Curly Hair Artistry members). Carleen Sanchez demonstrating proper plopping style. Looking Fresh!